Blue Midnight is a beautiful shade of blue with a bit of green undertone ALMOST giving off a teal color in some lights. This polish gives you that same soft velvety/velour/matte finish as the others in this collection. Application wise, I got full coverage at 2 coats. I added Stop Flirting from the Party Girl in a gradient form. 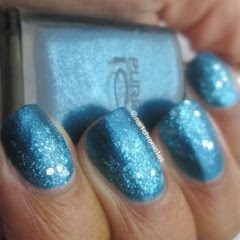 Stop Flirting is a beautiful fine sky blue glitter with larger silver glitter scattered throughout. I took a picture in the shade to show the color of Stop Flirting a little better. I really am loving this Runway Trend collection by Pure Ice. At a price point of $1.97 you really can't pass these up. Look for the display at select Walmarts. FYI: the displays are in some of the strangest places. I found them in my store by the hair color.